Are you one of the CPAs that doesn't use QuickBooks Accountant Edition because you don't fully understand how it works? If you've held off using QuickBooks Accountant version before, now you can avail yourself fully of what this software offers you and your business. If you've been using the software, use this resource so that you can take full advantage of what it can do for your clients. 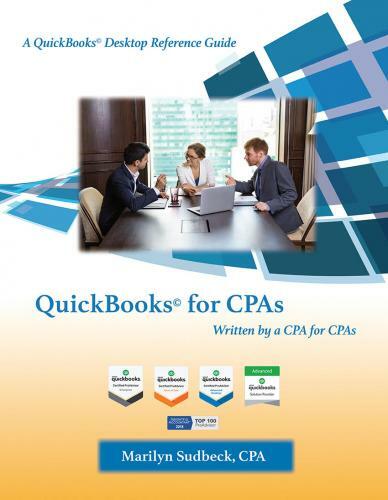 "QuickBooks for CPAs is a “must have” resource for every CPA who uses QuickBooks Accounting. Marilyn Sudbeck is a very knowledgeable and experienced QB instructor and has been teaching QuickBooks classes to CPAs at CPE4U Colorado for over ten years. She knows the software extremely well, and because she is a CPA she is best suited to help other CPAs use QuickBooks efficiently and effectively." "Marilyn's book is a welcome addition to any CPA's professional library. It's a clear and concise guide for professionals. No more befuddlement or bewilderment with the intricacies of QuickBooks." "Marilyn has managed to take her years of teaching and working with QuickBooks to encapsulate them into a wonderful book for the professional accountant. CPAs can better navigate through the sometimes complex task of working with QuickBooks using QuickBooks for CPAs." "Finally a source for professionals that use QuickBooks and want to learn more. Great tips, short cuts, and reasons to use them. I use this in my business all the time. I like this book!"